»Are Blacks Close to Receiving Reparations? You Are Here: Home » Local News » The first Annual Haitian Heritage and Cultural Arts Celebration, a huge success! The first Annual Haitian Heritage and Cultural Arts Celebration, a huge success! Commissioner Beverly Perkins, Andy Cherefant CEO/Founder Save Our Boys, Inc., State Rep. Patricia Williams, State Rep. Al Jacquet, and Commissioner Mike Sobol. With every beat of the drum accompanied by the voice of Inez Barlatier, the audience remained captivated. They clapped and sang loudly being suddenly taken back to a time where many were just young children listening to their grandparents sing to awaken the forces of their ancestors to protect the many desperate Haitians that made the life-threatening choice to take to the sea in search of a better life. Over 30 years have passed and today on Sept. 15, 2018, Save Our Boys, Inc. highlighted the successes, gifts and commitments of the leaders that birthed from that era. Andy Cherefant Founder/CEO of Save Our Boys, Inc identified the need to share and highlight the great work of both Haitians and Haitian-Americans in South Florida. According to recent Census, Broward is home to over 116,000 people of Haitian ancestry, who are a viable force increasingly gaining political presence while contributing to the community as nurses, teachers, physicians, engineers, artist, lawyers and more. 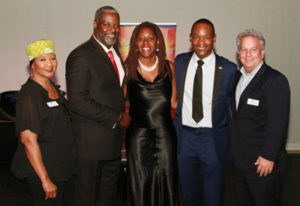 A nation known for its resilience and strength against adversity; Haitians are consistently labeled as “Hard Workers”; that hard work was celebrated by Andy Cherefant, and his team of sponsors, dignitaries, volunteers and guests. Congratulations to the Honorees: Zeek Mathais, an a-ward-winning Haitian Artist whose breath taking piece “Neg Mawon” (Brown Man), which reminds the world what very little armor and God-given internal strength and determination led to the independence of Haiti. Representative Al Jacquet, Florida House of Rep. Quet, Florida House of Representatives, District 88 who also captivated the audience by both thanking his parents for the discipline, focus on education and deep work ethic that was instilled in him and paved the way to his success, ensuring that our concerns and needs are heard on a larger political stage, Newton B. Sanon, Lesly Jacques, Rev. Dr. Jacques Durmonay, Dr. Patrick Jabouin, Rev. Hector Clerveau and Educator Karlie Richardson were all recognized, detailing their outstanding contributions to the community through media, church, politics, education and philanthropy. The atmosphere remained colorful, festive and exciting with song, visual entertainment and the taste of Haitian cuisine. I would like to personally thank Inez Barlatier, Marie Ketsia Theodore-Pharl, Dadly Filius, Cindy Foley, Gina Demergeau-Lasseur, Pierre LeBlanc, Anthony Louis, Mdorest Production Chef Tony’s Restaurant, Radio TV Florida, Strings and Steel Music Duo, City of Pompano Beach, Broward County Florida Cultural Division, Florida Department of State Division of Cultural Affairs, Old Dillard Foundation, Baccus Global, Gaicon LLC, Bogle Vineyards, Commissioner Rex Hardin and The Cherenfant Group for their contributions to this events success. Last but certainly not least, the beautiful and engaging Mistress of Ceremony, Regina Bell, for her strong voice, humor and professionalism, which show cased the gifts that Haitians and Haitian-Americans share in our community.